What does this sign mean? Hint: It was taken in South Carolina today. The winner will be the most correct or most creative answer. My wife may not enter the contest. Please use the comments to guess. What?! "Wipeout" was filming in South Carolina today?! IF YOU HAVE A ZIT AS BIG AS YOUR HEAD.....PLEASE GO OVER THERE!!!! 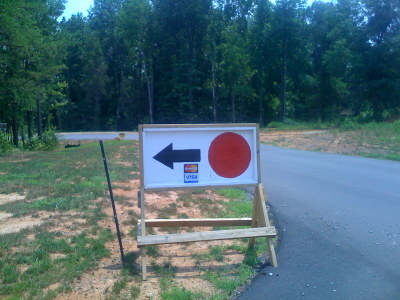 sign for "Discount Japanese Flags - Irregulars and Factory 2nds"
Turn left for the fires of Hell. Mastercard and Visa accepted.